In this week’s episode Pat Roach joins in as a guest. Darren starts things off with a discussion on whether violence is declining; a review of Steven Pinker’s The Better Angels of Our Nature. Adam passes judgment on courtroom television shows and Pat explores the myth that Steve Jobs stole the mouse from Xerox Parc. Did Steve Jobs Steal the Mouse? This entry was posted in The Reality Check Episodes and tagged Judge Shows, Steve Jobs Stole The Mouse, Violence Declining. Bookmark the permalink. I know of at least one Canadian court show… in french! 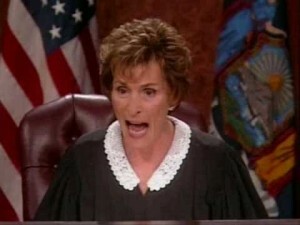 Also the show goes up to 7000$ which is more than Judge Judy does! Mon boulot: barmaid . Est-ce un défaut d’être attentionnée ?